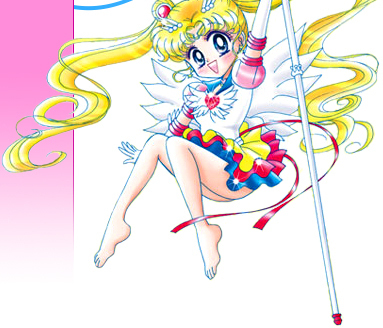 In Brief: Sailor Moon's first attack, Moon Tiara Magic is also her most famous one. It was first used in the first episode of Sailor Moon and used continuously throughout subsequent seasons until Sailor Moon powered up to her Eternal form in Sailor Moon Stars, which surprisingly doesn't feature a tiara! Cultural: Tiaras were used by ancient people in Mesopotamia and unlike today, their tiaras were made out of leather or fabric. The Persian tiara featured less fabric and more jewels bringing it closer to the modern version. Today a tiara is a lot more basic made from metal and normally in a basic semi-circle occasionally featuring numerous jewels and normally used in special occasions such as beauty pageants or a wedding to recreate a sense of history and importance. Funnily enough, tiaras are almost always worn on top of a woman's hair, however Sailor Moon seems to have her's focuses mainly on her forehead with the sides slipping under her fringe and attaching itself just in front of her ears. Tiaras in general symbolise power and a sense of royalty. The Attack: Sailor Moon begins the attack by removing her tiara from her forehead with her right hand and activating the red gem which begins to glow a bright gold. Next the whole tiara begins to spin so fast that the tiara begins to look like a golden ball of energy. At this point the tiara is actually hovering above Sailor Moon's hand as Sailor Moon also starts to turn around, similar to an Olympic hammer thrower when trying to give momentum to the hammer. After spinning around once, Sailor Moon stops and slides the tiara back, behind her and then flings it out at the target. The attack has been used in a surprising amount of different ways. In Episode 7, An Uncharmed Life, Sailor Moon used Moon Tiara Magic to lasso a Youma and contain it. 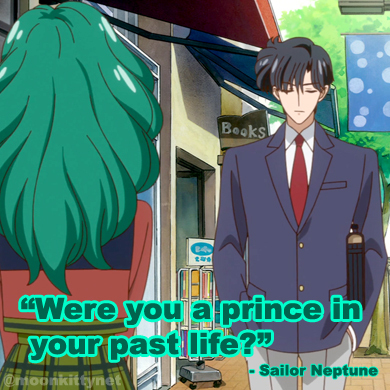 In Episode 19, Molly's Folly, Sailor Moon showed the ability to stop the attack in mid flight to prevent it from harming Molly who was in the way and in Episode 23, Mercury's Mental Match Moon Tiara Magic was used to weaken a Youma by attaching itself to it's forehead and electrocuting it to bring it's power level down to a lower level so the Sailor Scouts could defeat it! In Episode 114 of Sailor Moon S, Sailor Moon uses Moon Tiara magic on a Daimon Heart Snatcher. For the attack, the same animation used for the attack in the first two seasons was used but the background was changed and Sailor Moon's broach / compact was also updated. Sailor Moon also uses the attack in Episode 123 of the S season but no animation sequence was used. Instead the attack was done off camera and in real time. In the SuperS movie, Super Sailor Moon used Moon Tiara Magic in real time as her form was different then than her original Sailor Moon form used in the animated attack sequence. "Will the new Sailor Moon anime in 2013 be subbed in English?"